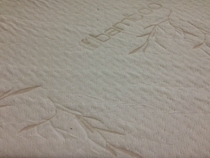 The addition of a latex mattress topper can greatly enhance your sleeping experience. We've all been there, bed wore out but not enough money to get a new one. By simply adding one of these toppers you can achieve a new feeling in your old bed. It won't take out the dips, but it will give you back that soft pillow top feel that has now compressed into near nothing but you and the springs. You might ask yourself "why is my bed doing this when it's less that 5 years old"? Answer, it was designed that way. It's up to you to keep the economic machine turning. Beds nowadays are not made the same as when we were kids. Comfort is what sells now, not durability. But why can't we get both? Well now you can. At Arizona Premium Latex Mattress Co. you can get that wonderfully comfortable feeling and durability too. Our all Latex Foam Mattresses can provide both. We are offering 4 different types of a latex core as replacement for your existing memory foam, air bed, waterbed, and latex foam cores. Use your existing zippered cover or replace that also from our selection of covers. 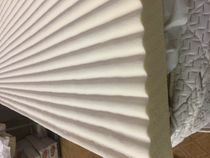 and 3 zoned variety.Lastly we have our tried and true "blended" natural/synthetic talalay latex cores. These cores average 60% synthetic-40% natural. 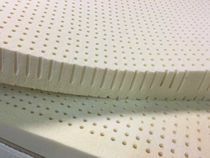 What is the difference between Talalay latex and Dunlop process latex mattress topper? 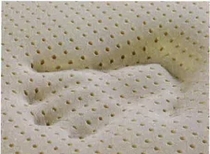 For more information on this subject please visit our Latex Mattress page.